Live Shows Late at Night! Branson Country USA Late Show is one of the best late-night shows in Branson that shares some of the amazing talents with special guest stars throughout the year. The show is broadcast live on radio stations and TV shows around the country. The two-hour show features an impressive line-up of musicians, singers, and comedians. With a rotating cast of performers and entertainers, this unique show provides a departure from the typical stage shows that you might have seen in Branson. Branson Country USA Late Show brings an entirely new and different production that you don’t see the same show twice. Branson Country USA is a custom-made show for anyone who wants to enjoy a fabulous Friday night out. The incomparable talented cast of performers of the show have stunning vocals, like those of good looking lads of New South, lead singer, David Raga, Jr.; tenor baritone, John Drockleman; popular bass singer, Mark McCauley; and from American Idol, tenor, Luke Menard. Two of Branson’s best female singers, Jackie Brown and Melody Hart are also featured in the show. The show also boasts co-hosts Mike Patrick and Jim Dandy, a.k.a. Jamie Haaga. Guests on the show also include exciting celebrity appearances. Some of Branson stars including Shoji Tabuchi, Mickey Gilley, and Roy Clark have paid a visit to the show in the past. The night show is the perfect nightlife entertainment for all ages where live audience can enjoy an incredible show that’s also broadcast nationwide on television and radio. The show can be heard locally on KRZK FM 106.3 in Branson, as well as in Springfield television and Harrison, Arkansas radio 102.9 FM. When Friday night comes around, it won’t be easy to end the fun. 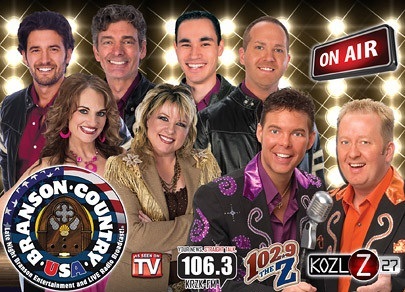 So don’t miss this late-night Branson entertainment every Friday night at 10:30 pm at the Grand Country Music Hall. With a roster of talented performers, the show features special guest stars from famous Branson entertainment district. From celebrities such as The Gatlin Brothers and Barry Williams to the up-and-coming stars of tomorrow, the weekly line-up is always an entertaining show not to be missed. The late night show is backed by the dynamic Grand Band. Watch the show and be a part of the audience. Once you see the red “ON AIR” light comes on, you’re sure to enjoy a grand time. The home of the show at the Grand Country Complex has been in Branson since 1971. Before it was changed to Grand Country, it was called the 76 Music Mall Complex. Branson Country USA Late Show is a diverse and variety-filled show that will provide every audience a fantastic ending of the day. The show features many different acts that were firmly rooted in country music. Whether you’re a classic or country fun or you like the current hits from famous singers – you will hear it all in this remarkable late night show. So, if you want to watch one of the best shows in Branson, catch a late night show with Branson Country USA Late Show.